It’s so easy when you’re newly motivated to keep focused on your goals. It gets a lot harder when life happens beyond debt payoff. Maybe you’ve got new bills coming in, or are having a tough time sticking to a strict budget. Whatever the case, take a few quiet moments each day to remind yourself why you started this debt payoff journey in the first place. You could do this just by closing your eyes and telling yourself out loud all of the dreams you have for when you’re out of debt. Another great idea is to get a visual going. Dream boards are no joke guys. My personal go-to is my bathroom mirror. I write down goals, or tape up pictures of things I want to accomplish or have. The bathroom mirror is unavoidable and that’s the way I like it. There’s no running from your goals when they’re staring right back at you every morning. Following along with others, or reading and listening to the experts in debt payoff is one of the best ways to keep your mind intentional and focused on your debt payoff journey. These are also great ways to get fresh ideas, new strategies and great reminders of just how tough this can be! We personally chose to take out a loan to finish paying off our biggest credit card debt. Our credit card was maxed at around $12,000 and even though we were making monthly payments of around $300, it seemed like less than half of that amount actually went toward our principal payment. No matter how hard we tried, it felt like we were just treading water trying to pay off this massive debt. Since our credit card interest rate was around 25% we decided to take out a loan with a much lower interest rate. You can get loan amounts starting at $7,500 with interest rates as low as 16.64% with the Loan Exchange and it’s free to apply online. If you find yourself in the same boat as we did, this is definitely a route I would recommend. Not only did we waste less money on interest, but it was also encouraging to actually see our debt go down each month instead of (almost) stay the same! Has debt payoff been so difficult because you find you are needing more money in your day to day living? If so, take time to review your spending habits and see where you might be over-spending. We personally struggle with this when it comes to our grocery bill. I am a big stickler for organic foods and I make nearly all of our meals from scratch. While I have done my best to reduce costs in this area, I still go over on our grocery bill from time to time. A great way to review your spending habits without crunching numbers all day is by using the Trim app. Trim will review your spending for you and can find your different ways to save. Within minutes of signing up, Trim let me know that we could be saving over $20 on our internet bill! This was great to hear because I have tried multiple times to reduce the cost of this particular bill and Trim did it all for me! If there is an area where you are continuously going over budget each month, it might be a good idea to consider reworking your budget itself. As I said, we were going over our grocery budget month after month, so finally I decided to actually budget an additional $100 per month toward our grocery bill! Instead of trying to stick to a strict budget that doesn’t work, allow yourself a little leeway and look for other areas in which you can cut back if necessary. Just like I find new junk to give to Goodwill month after month, I seem to always find new ways to cut back on things in our budget. Be honest with yourself about wasted money on cable or unused subscriptions and gym memberships. I am a huge advocate for going to the gym, but if you’re not making it enough times in a month to get your money’s worth, it might be a better idea to just find ways to work out at home and skip the cost of an unused membership. While you might spend some time compromising your budget and changing things around, it’s also important to find areas where you won’t budge. Because we have been very disciplined with our Debt Snowball debt payoff, for us that means we will always contribute our additional $200 per month toward debt no matter what. 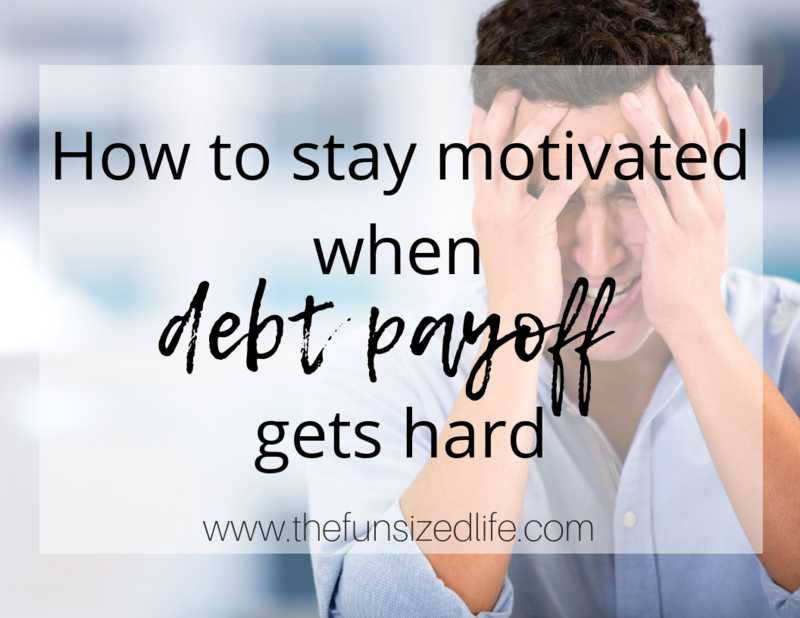 It’s important to have certain areas of your debt payoff that you insist on sticking to, especially if you want to stay on track and keep knocking debt out-of-the-park. Just like you should review your budget and spending habits, you should also take the time to review your debt payoff itself. I know first hand how intoxicating it can be to get that debt paid off as soon as possible. One week, I hustled so hard we were able to come up with an additional $1,200 toward debt payoff. The problem was that I tried to keep this momentum going week after week, month after month and I shouldn’t have. When back to school hit we wound up having to dig into our emergency fund for things like school sports, clothes and supplies. I had stopped sticking to our sinking fund method and was putting every single extra dollar toward our debt payoff instead. Having to dig into our emergency fund only meant having to rebuild it back up. We didn’t actually get any further ahead on our debt payoff, because we were having to add another $1,000 to our savings each month. See 12 ways to save over $1,000 fast. If your debt payoff method is too strict or isn’t working, it’s important that you acknowledge this quickly to avoid digging yourself into bigger financial mistakes down the road. If you follow the Financial Peace University program and the Debt Snowball method, you know what I’m talking about. Paying off debt intensely is great, but it’s not always practical. Dave Ramsey uses the analogy of the gazelle bobbing and weaving to avoid being caught by a lion. More often than not, the gazelle gets away and outruns the lion. Paying off debt like a gazelle is absolutely great. Do what you can, bob and weave, and avoid debt like your life depends on it but remember, even the gazelle needs to rest! It’s quite literally impossible for anyone to bob and weave for months on end. Sometimes you gotta slow down and recuperate in order to keep up the fight! So keep up the fight, take breaks when you need it and don’t get too focused on your goals that you create other problems in the process. Good article. We have been debt-free for some time now and what a blessing it is. I also recommend the Dave Ramsey method. Thanks for posting this!